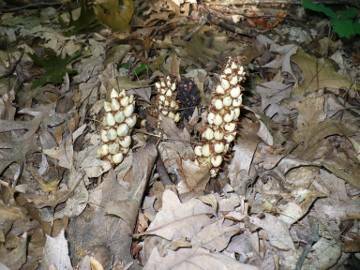 WCLT - Nature Notes 5/22/2015 - Pine cone, corn cob, or parasitic plant? Squawroot in the spring, growing among dead oak leaves. Pine cone, corn cob, or parasitic plant? Is it a plant or a pine cone? Or maybe a corn cob? If you find yourself asking these questions, you’re probably looking at something called squawroot. And you’re also probably on a trail in the woods, standing near some oak trees. Strange as it may seem, you’re looking at a native plant – an uncommon one. 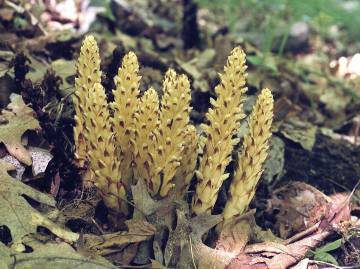 Squawroot (Conopholis americana) is a parasitic plant. It grows on underground tree roots, specifically those of oaks. As you can see from its color – yellowish or brown, depending on the season – squawroot isn’t green. Unlike most plants, it has no chlorophyll, so it can’t manufacture its own sugars. (In fact, gene sequencing has shown that genes needed for photosynthesis are missing in squawroot.) Instead, it takes what it needs from the oak roots. Over vast periods of time, its leaves have been reduced to scales, so it looks like a scaly brown pine cone much of the time. Surprisingly, squawroot is a flowering plant. It’s a perennial that comes up every year and may live for 10 years. What you see in spring, usually in late May, are actually the plant’s flowering stalks. They grow 4-8 inches high. The stalks look light-colored and fleshy, somewhat like corn cobs seen from a distance. They bear many small, tube-like, hooded yellow flowers. One flower peeks out above each scale, and scales cover the stalks. Bumblebees and flies pollinate the flowers, drawn by a scent that they can detect but that we don’t notice. After flowering, the stalks dry and shrivel up, looking very much like brown pine cones among the old dead oak leaves on the forest floor. White seed capsules develop on the stalks. The seed capsules might remind you of corn kernels. Animals that eat the stalks and capsules spread the seeds in their droppings. Squawroot in summer, with white seed capsules. Another name for this odd plant is bear corn, or bear corm. This name comes from the corncob-like look of the plant, and from lore – probably true – that hungry bears like to feast on the fleshy stems when they come out of hibernation in the spring. Deer also may eat the stalks. People, too, have been known to eat them. The plant has yet another name – American cancer root. It contains no substances with anti-tumor effects, so this name may seem puzzling unless you know the story of the plant’s underground connection with oaks. When the plant’s roots grow through the soil and find the root of an oak tree, they burrow into the oak root until they reach the layers that transport sugars and water throughout the tree. This connection brings nutrients flowing to the parasitic plant, and also stimulates the oak tree to form knobby growths where its root is being tapped. These growths are probably the source of the name cancer root. Squawroot doesn’t seem to harm the oak tree, however. What about the name squawroot? Like so many native plants, squawroot had medicinal uses among Native Americans. It was a treatment for symptoms of menopause, leading to the name squawroot. A tea from the plant also served to treat headaches and bleeding in the uterus or bowels. Squawroot works as an astringent, causing skin and tissues to contract. Interestingly, the tannin in oaks works the same way. Squawroot is currently found in all states east of the Mississippi River, and in similar parts of Canada. It is not common, however, so it’s best to leave it undisturbed. In New England, it is state-listed for protection in New Hampshire (“threatened”), Rhode Island (“special concern”), and New York (“exploitably vulnerable”). Squawroot is in the broomrape family (Orobanchaceae), which contains plants that are parasitic or partially parasitic (meaning that they have regular roots as well as roots tapping into other plants). Other parasitic plants that you might notice in our area during the summer or fall include beechdrops (Epifagus virginiana), which is parasitic on beech roots, and Indian-pipes (Monotropa uniflora) and pinesaps (Monotropa hypopithys), both parasitic on underground fungi that form mutually beneficial “fungus-root” or mycorrhizal connections with tree roots. If you spot squawroot during one of your walks along Westborough’s Charm Bracelet trail or elsewhere in our local woods, take a moment to enjoy this wonderful oddity of nature. This is the month of the flower moon (a traditional name for May’s full moon, on May 4 this year) and a perfect time to marvel at the many different ways that plants have of surviving.